In On-Premise world customer could use transaction code SNRO to create and maintain their custom number range object and consume via function module NUMBER_GET_NEXT. In C4C it is not possible to use this backend approach for partner. In this blog a simple approach is introduced which fulfill the custom number range by leveraging custom Business object developed via Cloud studio. 1. 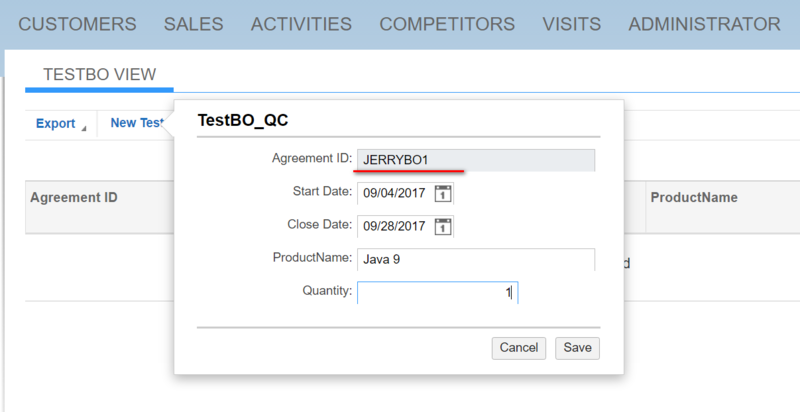 Every time a new Custom transaction BO is created, the new ID is automatically populated by the Number Range Business Object. This behavior is exactly the same as the one in On-Premise world. 2. The current number interval is stored via an instance of Number Range object, which means even if you log off and log on system again, the current number range interval is loaded from backend persistence, instead of starting from scratch. // Used to distinguish between different number ranges. // Constant prefix of the generated number. // The (formatted) number itself. // If true, a blank will be placed between the formatted number and the suffix. // Latest generated number (Prefix + Number + Suffix). // Counter for the number generation itself. // Minimum and maximum values of the counter. // true as long as we haven't reached the maximum value of the counter. 2. Implement action InitializeInstance. Here I hard code the max number as 999999999. 3. Implement action GenerateNextNumber. The logic is a simplified version of the good old function module NUMBER_GET_NEXT. // Initialize the counter in case the object is new. // Put the new value together. 4. In your transaction custom BO, consume the function exposed by Number Range BO in AfterModify.absl. Here I hard code the number range prefix as “JerryBO”. You can for sure even use different prefix based on for example different transaction type of your custom BO. I meet another issue, when I Batch import the document. the first bo instance is a range number, and the second bo instance I want to number+1(all in the modify event). I want to use the NumberRange.DrawNumber, but it get the same number, not number+1.